Most of us think of clarity as a preferable state to be in: something to strive for, and cling to; whereas the opposite state: the lack of confidence we experience when we don’t know, is one that leaves us in despair. We avoid that confusion as much as possible, and when it happens become desperate to escape and get back to that state where everything (ourselves included) has a place. This extends into the other feelings that we avoid-- sadness, anger, pain-- in place of the easy ones: love and joy and lightness. Of course, love and light is not the entirety of existence (and I'd argue that anybody who says so is deluded), much like periods of confidence and knowing are not always an indicator that we’re doing life right. True clarity is not just the clarity and confidence of knowing who we are and where we're going, but also the clarity of understanding that this will change, and that there will always be periods when we feel lost. I'd go even further: these periods of confusion are the times that we grow. It might not feel good (do growing pains ever feel good?) but they are a sign that the world we know is shifting. We are uncomfortable with that: it's like a sweater that shrunk in the wash. The best thing of course is to find a new sweater, yet the majority of us insist on trying to fit into the old sweater even though it is far too tight. Thus ensues the battle: the insistence that the sweater should fit, the grief that it doesn't and the denial that it won't ever fit again. Eventually we accept it, then find a new sweater and love that new sweater, and feel comfortable and confident in it. Until it too shrinks in the wash, and the process repeats itself. Most of us feel, in periods of clarity, that the sweater we have found will be the forever sweater. Its only the especially masochistic of us who, when starting to feel that first twinge of discomfort go ‘oh cool, here comes the transition!’. But there is so much meaning in the transition. Back when I was a daily yogi, I always wondered why people talked so much about the poses. The poses! The poses! There are Instagram accounts full of the poses, Facebook profiles highlighting the poses, entire magazines dedicated to being better at poses. I always turned towards systems that emphasised flow and movement, and I used to think it was because I had issues with sitting still, and at the time I did. But the more I deal with my own crap and learn that existing with myself isn’t such a big deal, the more I realise that we’re all built to move, and at different paces. Moving to outrun ourselves isn’t a good thing, but moving because that’s our nature as human beings, that’s who we are, what we’re built for. In focusing on the poses, we’re losing out on the things that get us there: transitions are important. They’re the areas in which we let down our guard, in which we brace for the scary, or hurry because we’re excited. How we handle the transitions tells us a lot about who we are, about who the people around us are. It took me years to realise that this applies to life outside yoga too. There is no such thing as clarity of purpose all the time. That would be like a life that was only made of yoga poses. We can go through life clinging to what was, feeling progressively more unhappy and not knowing why, or we can accept that the clarity breeds confusion just as confusion breeds clarity. They are the yin-yang of the life-path: one extreme arises from the other, and vice versa. Life is change: you can resist the change or you can get big enough that you ride the change. As with everything in life, it’s a choice. Have you ever been far enough out at sea that you can lie on your back and spread your arms and legs out and close your eyes? It can be quite scary: waves will often break over your head and fill your nose with salt water, and then you have to kick up, and you can’t reach the bottom and your nose is filled with salt water. The next time you lie back down, it’s with apprehension: the wave is coming! It’s impossible to enjoy the feeling of floating suspended in the sea knowing that a wave is coming (and that there are ferries nearby, and let’s face it, possible tsunamis too). Lying in the water bracing for waves (or ferries or tsunamis) is a way to become terrified of the water. What has to shift is our mentality, when lying back in the water—not tensed in fear of a wave, but accepting that the wave will come. Because the wave will come regardless of whether we are tensed in wait for it or not. And usually what I have found is that when accepting that the wave will come, my fear of the wave dissipates. 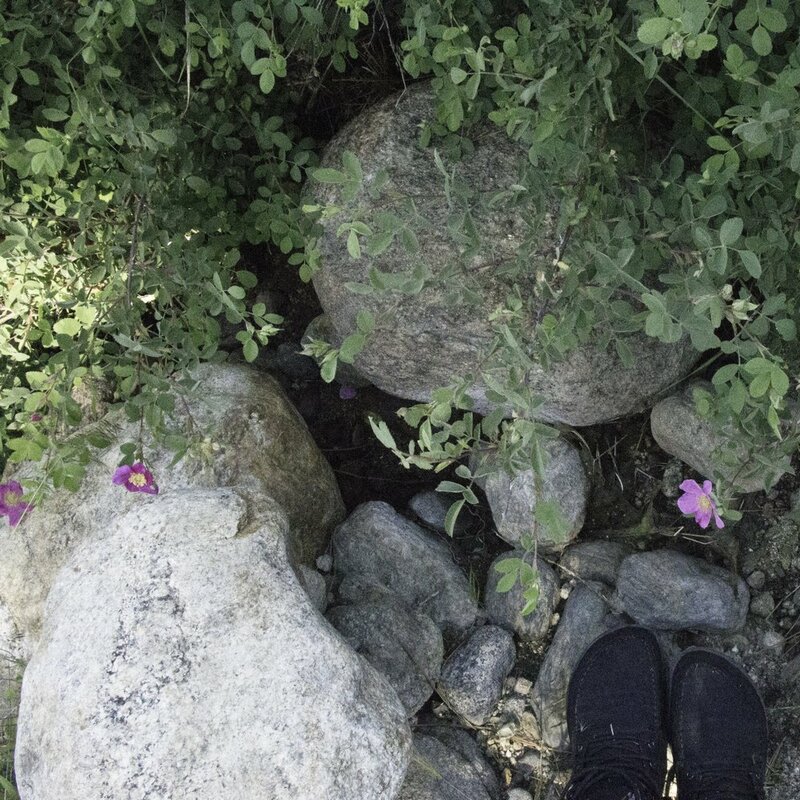 I expand into the water around me, can feel the fish swimming below, and the sea grass on the sea floor, and the ships in the distance, and where the water seethes against the rocky shore. When the wave comes, I am the wave and I am waiting for the wave and I experience the wave, and the wave moves on and astoundingly, the majority of the time, it no longer breaks over my face and fills my nose. Maybe in my acceptance and relaxation towards the situation, the subtle current has turned my body so that the waves no longer break over my face. Maybe my body is now relaxed so the waves just lift me up and drop me back. Maybe the first wave was a freak wave, or maybe I was just in the wrong place at the wrong time. Times of confusion, they’re a bit like being out in the water. It’s in these transitions that the answers come, and its in these transitions that we can find out new things, seek new answers, grow if we choose to. It’s in the transitions that the mysteries arise, that the fog grows deep and shadows appear. In the bright light of knowing we are safe and secure: our doors are locked and the battlements are armed. In the darkness of the unknown we are open and vulnerable: we can brace for the shadows to attack, or we can open ourselves to the possibility that maybe those scary shadows aren’t all waves waiting to crash over our heads and drown us. As I mentioned before, that choice is up to us. The clarity of the sage is that of time and perspective; the wisdom of the ages: not just the immediate but of the grand scale of things which includes the fog and the transitions and the waves crashing over our heads. The gift of the sage is to clear, to blast through, to open our eyes to what is, to get rid of the detritus and mess. The clarity is in understanding that both the enjoyable and the miserable will pass, that each of these things is a carefully executed pose, held onto only because it is assumed that the meaning itself is in the posture, when truly, the posture is the reflection of the movement into it. And out of it. In that, it makes us bigger: allows us to digest more, to take in more, to assimilate more: it is a place where ‘self’ and ‘not self’ becomes a foggy boundary, where we move back into being how we were at the beginning of it all: curious and open and accepting of what is. 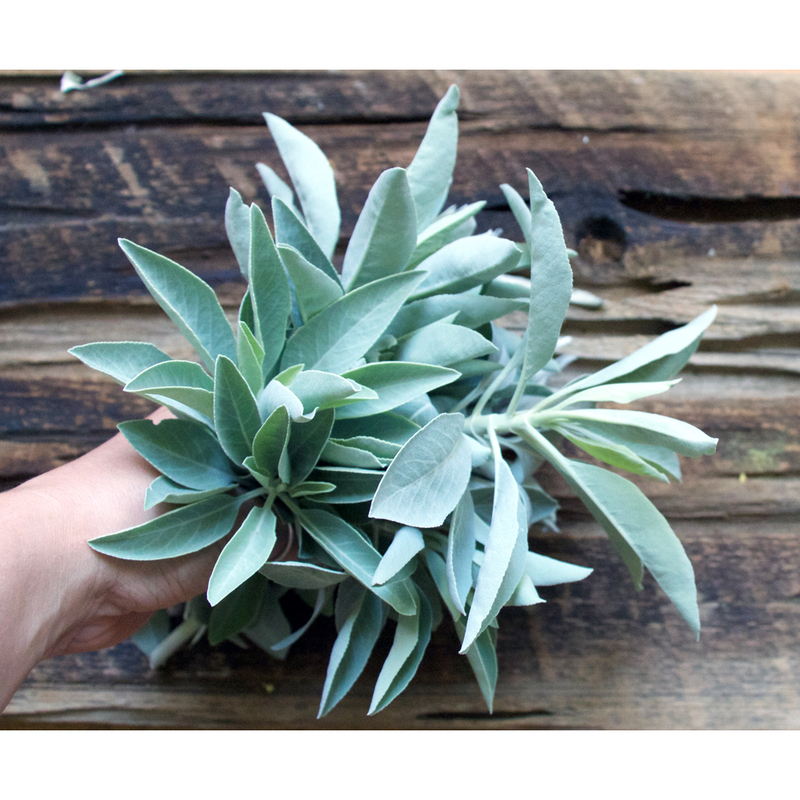 This is a simple recipe that you can make with any kind of sage, be it garden sage or wild. Here in Southern California, our local black sage (salvia mellifera) is absolutely gorgeous infused in honey, and salvia clevelandii is lovely too. Desert sages like chia and s. Dorii are also lovely. 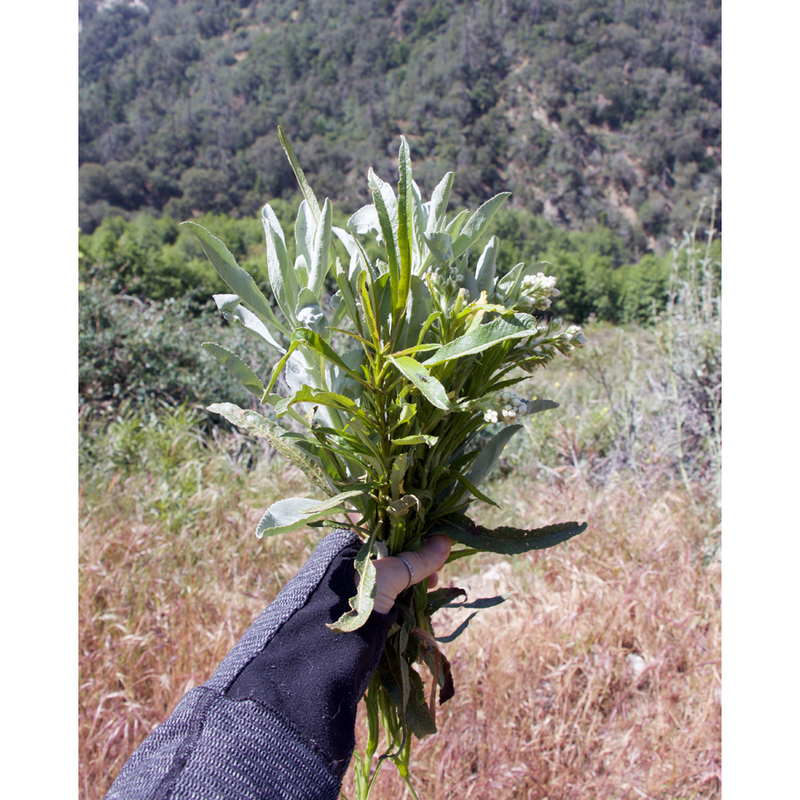 If you have wild sages growing local to you I’d highly recommend playing around with them. Or you can use regular old garden sage— there’s a reason it’s so popular and common. Stuff a jar full of chopped sage leaves, and cover with honey. Leave somewhere at room temperature for a month, then heat slightly, and strain out the sage. You can use this honey to drizzle on meats and cheeses, to drizzle over ice cream, to flavour herbal teas, or just to eat by the spoon. Medicinally it’ll help soothe sore throats and make diaphoretic teas taste better.